Enterprise Bank is proud to once again join Anton’s Cleaners and Jordan’s Furniture as a corporate sponsor for the Belle of the Ball prom dress collection program. Do you have prom dresses and gowns taking up space in your closet? From February 4 through March 30, all 24 Enterprise Bank locations will accept donations of gently-worn, trendy prom dresses. Prom season is a major milestone and one of the biggest life events for high school girls. For students with limited financial resources, prom can be a source of tremendous stress. The Belle of the Ball prom dress drive provides a dress, shoes, handbag, and jewelry so that hundreds of girls can attend their prom feeling beautiful and confident. Belle of the Ball collects, cleans, and distributes donated prom gowns and provides new accessories to high school junior and senior girls who otherwise would not afford to attend their prom. The highlight of the program is a day-long event where hundreds of deserving girls are invited to the boutique for a day of pampering and personal shopping for a dress, shoes, and accessories. Volunteers at boutique day help the girls choose a prom gown and coordinated accessories. 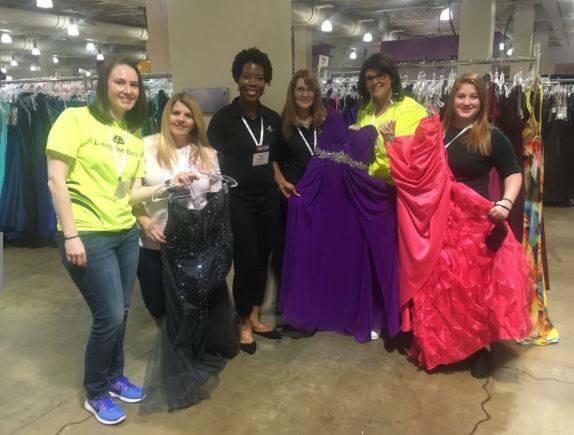 Several Enterprise Bankers volunteered at the 2018 Belle of the Ball Boutique Day, helping girls to choose a dress, handbag, shoes, and jewelry.